June has always been bittersweet. It is the half-way mark for this twelve months. My birthday rolls around and I tick another year off on the march toward old age. June means the next three months will bring warmth and outdoor activities, the fleeting time of sun-kissed skin and bare toes. I still feel the joy of the school year ending. The relief of a kid let out of the routine. Even though my routine doesn’t necessarily change, it feels like a load is lifted and life holds the promise of lazy days and freedom. Here in the Northeast, it means a complete change of wardrobe, the lightening of layers, the turtlenecks and sweaters exchanged for soft cotton t-shirts, faded and worn to perfectly drape. There are hours of light left in the day when the work routine ends. Evenings of open windows that bring the gentle songs of toads and crickets. I am a summer baby, a mercurial Gemini with the happy twin who starts as a fleeting shadow and grows longer and stronger, fed on a season of bounty. Fireflies and grass between my toes, take me back to childhood imaginings. I want a spanking white pair of Keds sneakers to mark the start of this half. I long for airy sundresses that just graze my skin. I crave the itchy discomfort of that first blush of sunburn. I want skinned knees and blistered heels, feet that toughen from barefoot walks on gravel roads. There is a lot of looking at the second half right now. This glass is half-full not half-empty; and besides, aren’t we all that kid in the orange gingham sun-suit and floppy hat riding a swing? This entry was posted in memoir. Tagged age, childhood, crickets, glass half full, looking back, New Hampshire, summer, sunburn. Summer brings so many outdoor pleasures. Backyard BBQ’s, a cold beer after mowing the lawn and plenty of “dirt therapy”. I truly enjoy the longer days and warmer weather, not to mention the smaller loads of laundry now that the sweaters and turtlenecks have been put away! Ah, I forgot to mention the lighter laundry loads! Dirt therapy is wonderful too!! Thanks for commenting!! 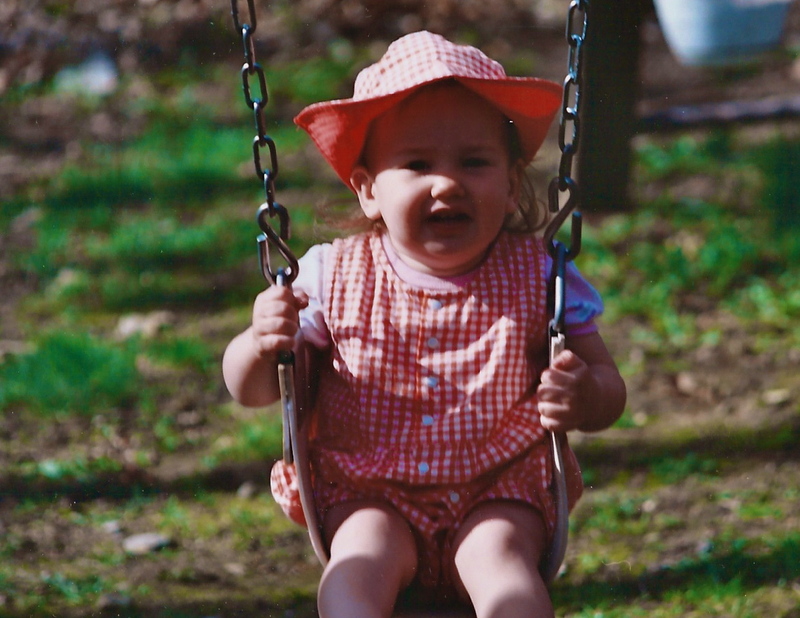 Similar age to you and swings seem to play such an important part to childhood don’t they? Found this by chance and enjoyed it! Thank you. Thanks for stopping by and commenting Cheryl622014. I will check out your posts! Thanks Terri. It is all a wonderful journey isn’t it? Thank you Aline! Such a lovely month so far!! Happy Birthday. I’m jealous-mine is in December. My birthday is at the beginning of May and I guess that’s why the fresh greens of spring will always be my favourite. Summer comes a close second though. 🙂 happy summer birthday!